Wedding Gifts that are unique and personalised for the happy couple that just got married. Our wedding gifts are unique and special, being personalised especially for the Wedding couple. To personalise the Wedding Gift select the label below and upload the photo and complete the boxes to great this unique and thoughtful wedding gift present. Perfect Wedding present to give as a gift to your fiancée, give as a gift to your friends who just got engaged and also perfect unique gift for the recently married couple. 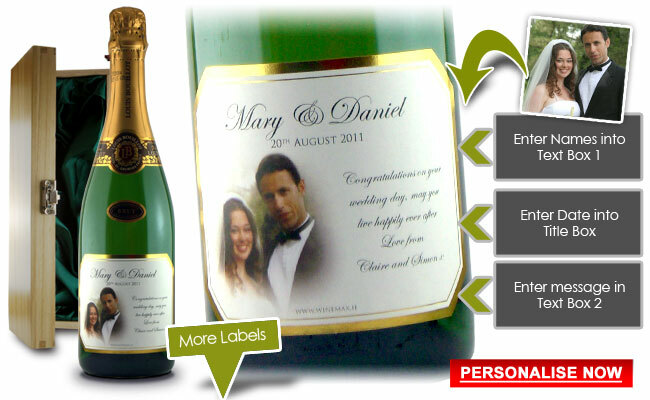 You can upload a picture on some of the labels to make it an extra special present. 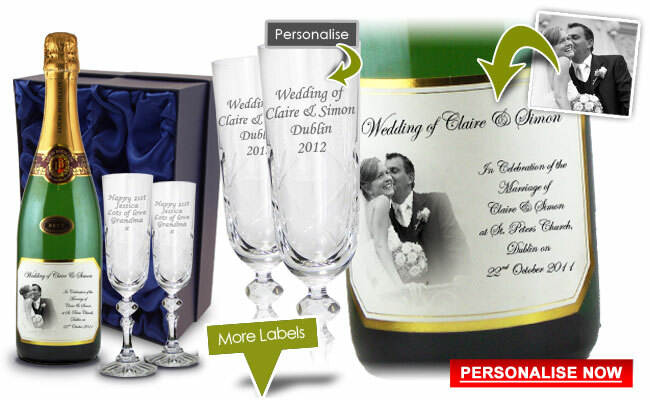 A truly unique Wedding gifts from Ireland includes a bottle of personalised wine, it can be hard to find a perfect wedding present or gift to give to the couple and with a bottle of personalised wine or champagne you cannot go wrong. The Wedding presents and gift will be unique because the gift can have an image of the couple on the bottle and a unique message written on it. This unique wedding presents and gifts will make a unique keepsake especially if the gift is bought with a wooden presentation box. The best gift to buy is a bottle of personalised sparkling champagne style wine in order to celebrate this great occasion. Know someone whose wedding anniversary is coming up or celebrating the anniversary of a wedding yourself? Then getting a personalised wedding anniversary gift is a truly unique way of gifting the couple with a gift idea they will never forget and bee able to treasure and keep for years to come. A anniversary of a wedding only comes round once, such as a silver or golden anniversary so it must be properly remembered and appreciated. With our range of personalised labels you can personalise a bottle of wine or sparkling champagne style wine with the wedding anniversary occasion and a personalised photo on the gifts and then your unique message writing how you wish the couple many more years of happiness together. Our wedding presents ideas are very unique and our designers will produce you a lovely present and gift idea customised for the happy couple. But not only are the gift unique but we can also send the gifts directly to yourself or to the couple. We have had many people email us telling us how surprised and happy the recipients were to receive our gifts and were very pleased with our direct service. We have had many years experience in produce unique wedding presents and shipping them direct you can be sure our service will impress the wedding or engagement couple. Personalised wedding gifts and presents make a great gift to give to any couple who are getting married and are celebrating their wedding. When your gift is personalised you are giving the couple something they can treasure and they will appreciate your gift or present even more. Personalised gifts are by nature unique, and especially with a photo of the couple, maybe from their engagement it will be a gift that will surprise them and show how thoughtful the gift has been. Personalised gifts are very affordable these days and the personalised wine will be a great gift and present they will enjoy, the couple may even choose to hold on to your gift till their first anniversary. If you buy the wedding couple a gift of personalised champagne for their wedding present they will be very impressed especially if you buy an extra wooden gift box. Engagement coming up soon and attending the engagement party. You will need to get a present and gift and you will need a unique idea, something that the couple won't throw away and you will want them to remember your gift. That is why you need a unique and unusual engagement gift idea. 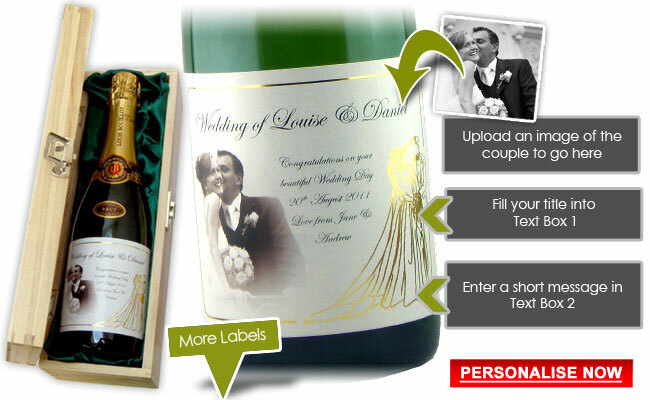 Our personalised wine can be very unusual if you choose to add a personalised photo of the engagement couple, add your own idea by adding your own personalised message on the bottle for unique engagement gift idea that will really impress the engagement couple. The gift will be even more unique if you buy the wine box presentation to make the gift idea even more special, also the wooden wine box with the champagne style personalised wine makes it even more special by making the gift look really good in the wooden wine box. Our gift ideas are very unusual wedding gift ideas and present ideas. Anybody at the wedding will find it very unusual, but at the same time be very impressed with your unusual gift idea. The wedding gift will be unusual because it will be unique and can have an image of the photo of the wedding couple. You can make the wedding or engagement gift even more unusual by adding a personalised message on the wine label or even personalised champagne label. The gift can be made even more special and unique and unusual by adding the presentation gift box to the order and this will really impress the recipients. unique wedding gift for friends and family. If you have a brother or sister getting married and don't want to get them the same stuff as everyone else then you will want to get them a unique gift and something different for their wedding gift. 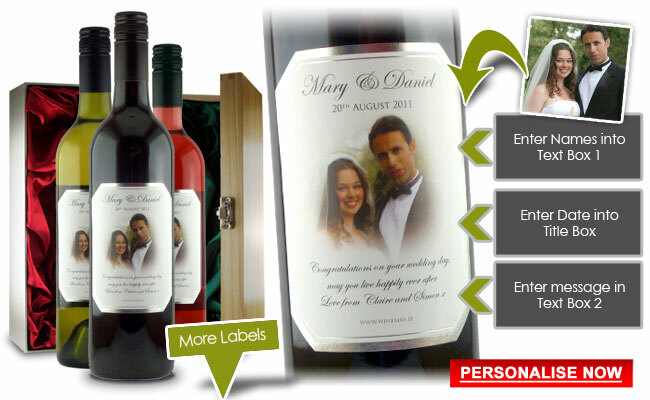 A bottle of personalised wine makes a great unique wedding gift idea especially if you personalise the bottle with a photo of the wedding couple and personalised message on the bottle. The gift can be made even more unique with beautiful presentation box, our wooden presentation box makes a great addition to your unique gift. Unusual wedding presents are very hard to find, but here at Winemax.ie we have made it easy to find the perfect present for any couple getting married in Ireland. Our personalised gift are very unusual and unique and make the perfect present, we have the testimonials to prove how happy our customers have been with our unusual wedding presents. Your wedding would be one of the most important days of your life. Obviously, you want the day to be perfect and everyone around you happy and smiling. In that case, you shouldn't forget to get a gift for your groomsmen as well. With everything they have done for you, it is time that you showed your appreciation with some amazing gifts for the groomsmen from Winemax. Choose from our collection of gifts, ranging from personalised bottles of whiskey or glasses to tankards and hip flasks. Let this be the kind of gift that they will find useful. Hey there, groom-to-be! Amidst the busy schedule of planning for your wedding, make sure that you don't forget about best man gifts. Yes, that's something equally important; after all, whether it is your brother, a best friend, or your future brother-in-law that's going to be your best man, you will have a lot of amazing memories with them that shouldn't go unappreciated. So, for your best man gifts, choose from our amazing collection, including personalised whiskey, hip flasks and beer glasses, the gifts are personalised to your liking to make it unique and more special. As a bride-to-be, we know that you will be involved in a lot of planning and arrangements for your big day. If you think about it, the one person that is with you throughout all these steps would be your bridesmaid, so show hr appreciation with a gift for your bridesmaid. The best way to show your appreciation is by choosing from our range of gifts for bridesmaid. Whether it is a necklace box, a trinket box, a chocolate bar, a champagne flute, or whatever it is that you choose, you can personalise it to make it even more memorable for your bridesmaid. Attending a wedding soon? Whether it is a friend's, a sibling's, a cousin's, a colleague's, or anyone else's for that matter, weddings are always special no matter how close you are to the couple. Therefore, it is important that you get the couple a wedding gift. When it comes to wedding gifts for couples, there is no better place than Winemax. From being able to personalise a bottle of champagne with a wedding message for the lovely couple, to going the traditional way of finding something romantic, you have plenty of options to choose from.